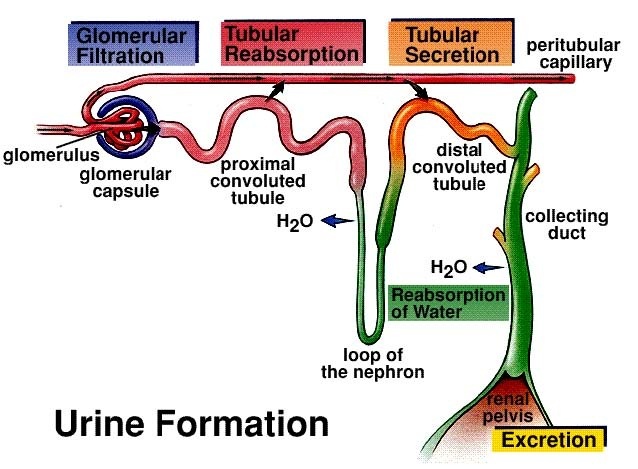 External and internal structure of the kidney with functions of the various parts; structure of nephron; physiology of urine formation - ultra filtration, selective reabsorption and active secretion. (product reabsorbed in each part of uriniferous tubule and the type of mechanism). Regulation of urine formation. 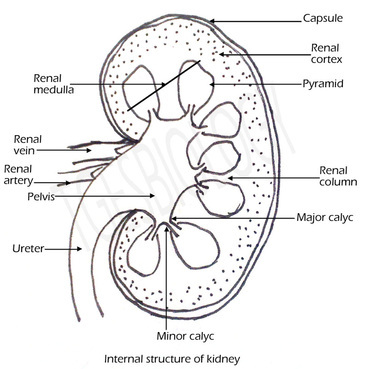 Counter current system, functions of the kidney. Role of skin and lungs in excretion. 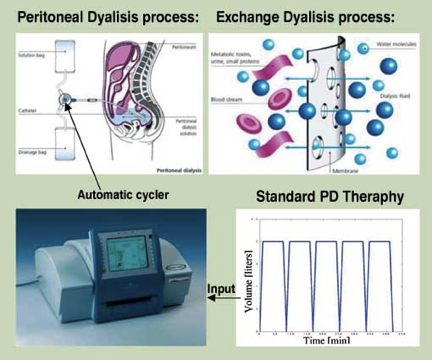 Brief idea of process of dialysis, haemodialysis and peritoneal dialysis. Disorders of the excretory system. (i) renal calculi, (ii) glomerulonephritis, (iii) uremia. Excretion is the process of removal of metabolic wastes by the living organism. These products can be toxic if they are retained in the body. the organs associated with the process of excretion are called excretory organs and the products excreted out are called as excretory products. The process of removal of nitrogenous waste products like ammonia, urea, uric acid etc, along with excess of water, salts and pigments out of the body is called excretion. It keeps the internal chemical environment constant, this is called homeostasis. Nitrogenous waste products have their origin in the breakdown of proteins by cells. Cells catabolize amino acids to obtain energy. The first step of this process is deamination. During deamination, enzymes remove the amino group as ammonia (NH3). Ammonia is toxic, even at low concentrations, and requires large amounts of water to flush it out of the body. Many animals, including humans, create a less poisonous substance, urea, by combining ammonia with carbon dioxide. An animal can retain urea for some time before excreting it, but it requires water to remove it from the body as urine. Birds, insects, land snails, and most reptiles convert ammonia into an insoluble substance, uric acid. This way, water is not required water to remove urea from the body. This method of ammonia excretion is particularly advantageous for animals, since they all lay eggs. If the embryo excreted ammonia inside the egg, it would rapidly poison its environment. Even urea would be dangerous. However, uric acid in solid form is a safe way to store nitrogenous wastes in the egg. Some living beings release waste in the form of ammonia. In the abdominal cavity below the stomach, on either side of the vertebral column. 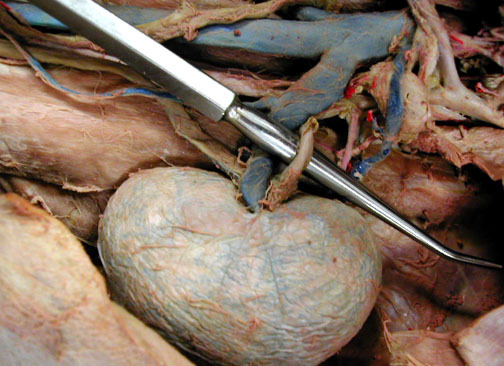 Attached to the dorsal abdominal wall by peritoneum called mesorchium. Cortex- Outer dark region has a dotted appearance. This region contains Malpighian corpuscles and the PCT and DCT. Medulla- Pale inner region has pyramid like structures containing the Henle's loop and collecting tubules. This blood is carried to structures called nephrons, which filter the blood. 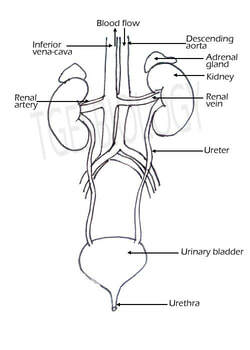 Glomerulus- Branches of the renal artery within the kidney produce afferent arterioles. Each afferent arteriole leads to a network of capillaries called a glomerulus. Blood leaves the capillaries of the glomerulus via an efferent arteriole and enters capillaries in the medulla called peritubular capillaries, that surround the PCT and DCT. 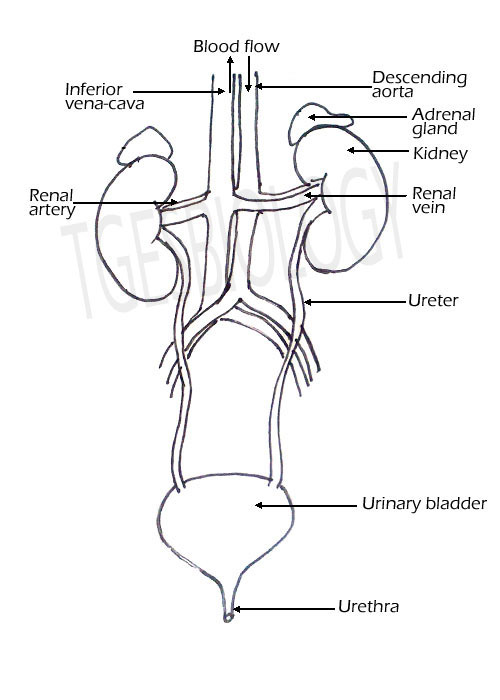 Venules from the peritubular capillaries lead to the renal vein, which exits the kidney and returns blood to the inferior vena cava. 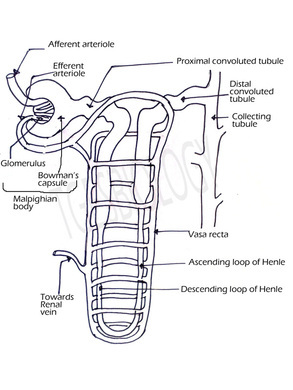 Bowman's capsule is the blind end of the nephron which is like a double walled cup. The outer layer is formed of squamous epithelial cells and the inner layer is formed of specialised cells called podocytes. 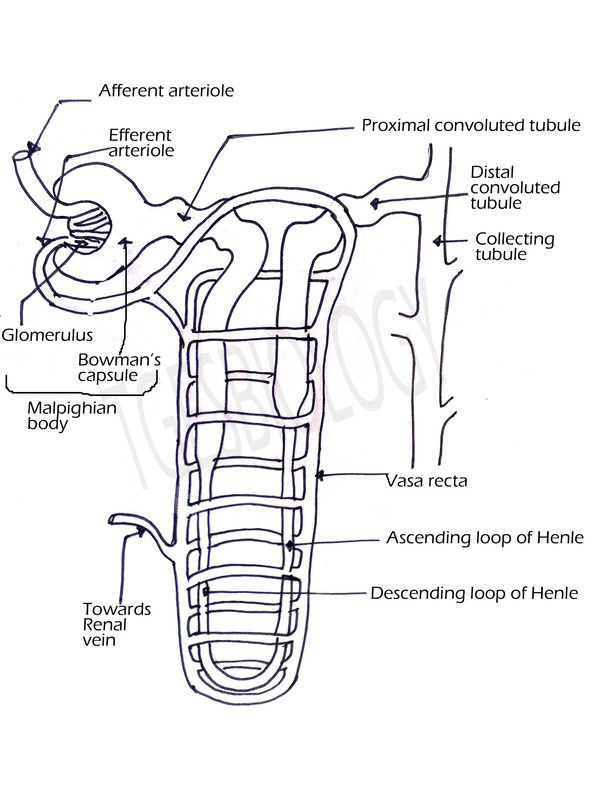 The tubular part of the nephron that extends after the Bowman's capsule is called as renal tubule. It has three parts- Proximal convoluted tubule (PCT), Loop of Henle and distal convoluted tubule (DCT). The ascending limb leads to a convoluted part the distal convoluted tubule which also lies in the cortex. This opens into the collecting tubule. This part excretes some ions and ammonia into the filtrate. It is 10-12 inches in length and half an inch in diameter. These enter the bladder through oblique tunnels that function as valves. It carries urine from kidney to the urinary bladder. It is a pear shaped highly distensible sac-like reservoir that store urine temporarily. It is lined by transitional epithelium. It is present in the pelvic region. The bladder can hold about 0.5 to 1liter of urine. Urea is formed in liver from ammonia. It is formed in collaboration with amino acid arginine in presence of arginase. It begins with amino acid ornithine hence is called ‘ornithine arginine cycle’. 1. ULTRAFILTRATION.- Filtration under high pressure. Bowman's capsule acts as ultra-filters. When blood flows through glomerular capillaries- all substances (except blood cells and plasma proteins) are filtered. Blood and the cavity of Bowman’s capsule is separated by two very thin membranes. Afferent arteriole has wider lumen than the efferent arteriole. All glucose and amino acids are reabsorbed by active transport. Most of Na(70%), most of K(75%) and large amount of Cl are reabsorbed by active transport. Urea, uric acid and creatinine. 75% of water by osmosis. Descending Loop- 5% water by osmosis. Ascending Loop - 25% K and some Cl actively reabsorbed. Renal threshold. The concentration of a substance dissolved in the blood above which the kidneys begin to remove it into the urine. Secretion of harmful substances from the blood into the nephric filtrate by the cells of DCT. Tubular secretion is of less importance in case of mammals. The K ions eliminated in the urine is in exchange of the reabsorbed Na ions. The DCT and collecting ducts secrete some amounts of uric acid and ammonia in the urine. Osmoregulation. (Osmoregulation is the control of the levels of water and mineral salts in the blood.) 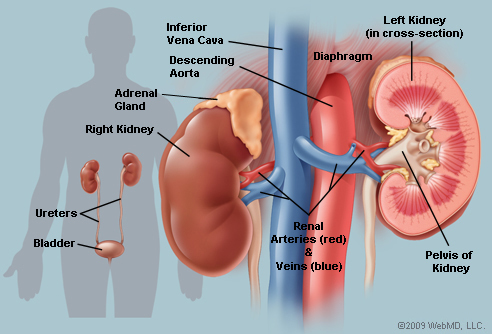 Kidneys play a role in maintaining the concentration and osmotic pressure of blood and extra cellular fluids. This way the osmotic concentration is maintained. The human body does not maintain a constant water volume, thus the kidneys have to compensate for the lack of or excess of water consumed. 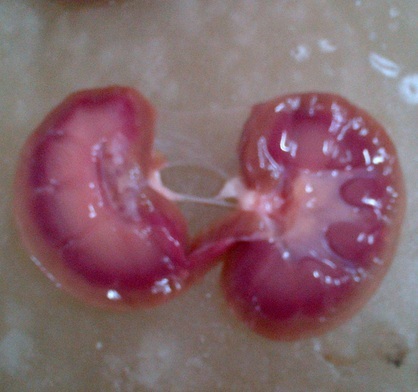 The kidneys use a transport system called the counter-current mechanism to accomplish this (Hoppensteadt et al, 186). Henle’s loop and vasa rectae play an important role in this mechanism. Glomerular filtrate in the Henle’s loop and blood in the vasa rectae flow in opposite directions in the two limbs of the loops i.e., towards the renal medulla in the descending limb, and towards the renal cortex in the ascending limb. These two counter current systems help in concentrating the urine. In the Henle’s loop, filtrate loses NaCl to the renal medulla from the narrow region and Na+ & Cl- by active transport in the wide region of the ascending limb. Thus, concentration of interstitial fluid increases. Water is drawn by osmosis from the narrow region and the collecting duct. Water enters the vasa recta and is carried away. Thus, concentration of solutes in the interstitial fluid is high. In the vasa recta, as blood flows in the descending capillary, water is drawn out from the blood plasma by osmosis. Na and Cl ions enters in the blood plasma by diffusion. 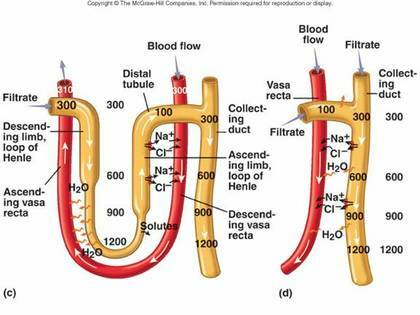 As blood flows from the ascending capillary, the reverse occurs. Water reenters and Na+ & Cl- leaves it due to decrease in conc of interstitial fluids. The counter current mechanism concentrates the urine by maintain a high salt conc in the interstitial fluid. This is called as the counter current multiplier mechanism. ADH/ vasopressin acts on the membrane of the collecting ducts of nephron. This increases the permeability of the ducts to water, so that more water is taken back into the blood. In the absence of ADH, ducts become impermeable leading to dieresis. Aldosterone has an indirect effect, this hormone induces the DCT to reabsorbs more Na and water. Thyroxine also plays an indirect role in urine formation. The renin-angiotensin system is a group of related hormones that act together to regulate blood pressure. It is called a system because each part influences the other parts and all are necessary for the whole to function correctly. The renin-angiotensin system, working together with the kidneys, is the body's most important long-term blood pressure regulation system. When the blood pressure drops for any reason, the juxtamedullary apparatus in the kidney detect the change and release renin into the blood stream. Renin converts inactive forms of angiotensin into angiotensin I.
Angiotensin I is able to alter the blood pressure to some degree, but it isn't strong enough to cause large changes. Instead, most angiotensin I is converted to angiotensin II, a much more powerful hormone that does cause large changes in blood pressure. Angiotensin II is a strong hormone, and can act directly on blood vessels to cause blood pressure increases. It also has another even more important function - stimulating the release of aldosterone. Aldosterone is a very powerful vasoconstrictor that causes large increases in blood pressure, but is more important because it can actually change the baseline filtering activity of the kidneys. 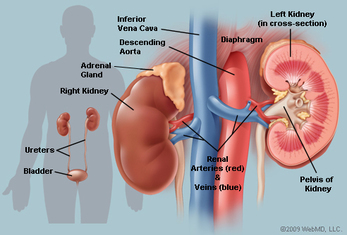 Aldosterone causes the kidneys to retain both salt and water, which - over time - increases the amount of water in the body. This increase, in turn, raises blood pressure. Angiotensin I, angiotensin II, and aldosterone do not live forever in the blood. Instead, they exist for a period of time and are then broken down by other molecules. The renin-angiotensin system, as a whole, responds to both short-term and long-term variations in blood pressure. It is activated by sudden drops in blood pressure - such as those that occur after blood loss - but is also stimulated by smaller, less dramatic blood pressure fluctuations. Another hormone, atrial natriuretic factor (ANF) opposes the RAAS. This small peptide is located in the atrial tissue of the heart. If blood pressure is high, heart stretches and releases this peptide into the blood. This inhibits NaCl reabsorption and reduces aldosterone secretion from the adrenal gland. 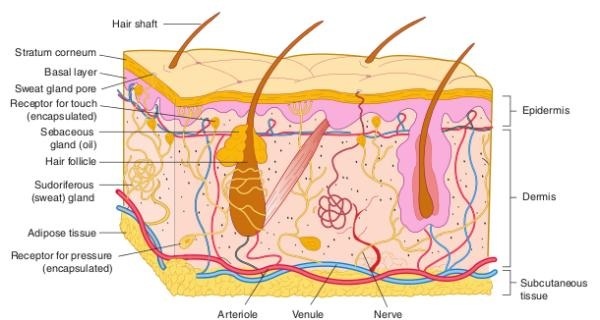 Human skin possesses glands for secreting two fluids on its surface, namely sweat from the sweat glands and sebum from sebaceous glands. Sweat is a watery fluid containing in solution primarily contains sodium-chloride, lactic acid, urea, amino acids and glucose. It helps in excreting mainly water and sodium chloride, and a small amount of urea and lactic acid. Sebum is a wax-like secretion which helps to excrete some lipids such as waxes, sterols, other hydrocarbons and fatty acids on the skin. 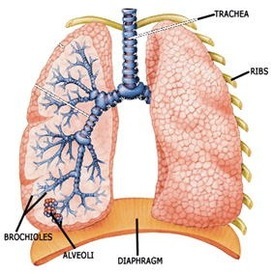 Lungs which are the main respiratory organs of vertebrates, help to eliminate the entire volume of carbon dioxide produced in the body, as well as some moisture, during expiration. The lungs maintain the blood-gas homeostasis through elimination of carbon dioxide. When lungs fail to eliminate enough carbon dioxide, the kidneys attempt to compensate. They change some of the carbon dioxide into sodium bicarbonate, which becomes part of the blood buffer system. Like healthy kidneys, dialysis keeps your body in balance. In hemodialysis, your blood is allowed to flow, a few ounces at a time, through a special filter that removes wastes and extra fluids. The clean blood is then returned to your body. Removing the harmful wastes and extra salt and fluids helps control your blood pressure and keep the proper balance of chemicals like potassium and sodium in your body. 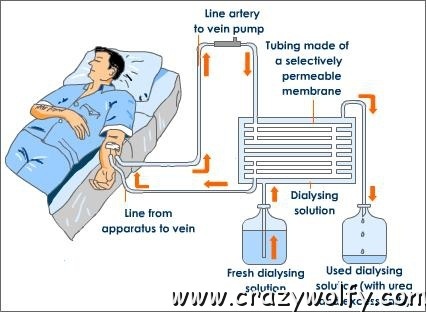 In this type of dialysis, your blood is cleaned inside your body. A plastic tube called a catheter into the abdomen (belly) to make an access. During the treatment, your abdominal area (called the peritoneal cavity) is slowly filled with dialysate through the catheter. The blood stays in the arteries and veins that line your peritoneal cavity. Extra fluid and waste products are drawn out of your blood and into the dialysate. 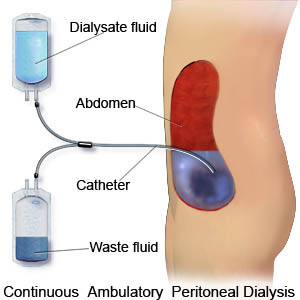 In CAPD, you carry about 2.0 - 2.5 litres of dialysis fluid in your peritoneal cavity all the time. An exchange is usually done four times a day by draining out the old fluid and refilling your peritoneal cavity with fresh fluid. The exchanges are often done early in the morning, lunchtime, late in the afternoon and at bedtime. Each exchange takes about 30 to 45 minutes. Assisted continuous ambulatory peritoneal dialysis (ACAPD) Assisted CAPD involves the use of simple equipment so that an extra exchange can be done while you sleep.